“I don’t embrace the stigma of that title,” he said. I felt the heat of embarrassment the moment I handed him my business card. I asked him, “How do millennial exchange contact info these days?” I asked. He did not take kindly to being labeled this way.What with all the technology these days, offering a piece of paper to slip into someone’s pocket seemed passe. At 48, I am an antique? Well, I do need guidance. His take on the millennial moniker interests me. I hope he calls, emails, texts, or PM’s me to set up a lunch meeting so I can ask him about it. An anecdote from my life. Maybe it will be called a blog. Then again, maybe not. I do not know what I hope for with it. He says write, write and write some more. Write badly. Just write. So….writing. I hope it helps me get free from thinking about an “audience” reading my words. Thinking about what would sound good, might persuade, what could make me look good. I’m tired of trying too hard. Wanting to be real, even thought “being real” is too-often used these days. It is a cliche. The irony of my cringing at hearing these things is that I often hear the words coming from my own mouth! Yes, I’m aware that I’m a hypocrite on this one. I do have an excuse. It’s hard to live with concern/worry for the future, and stay hopeful/positive at the same time. It’s not easy to try and embrace new ideas and new ways of doing things….and the people (i.e. millenials and others) who are doing them. Sticks and stones may break the bones, but labels? Susannah & Kevin Barton celebrate12! What do you get when you add up the following? 5:45am boot camp The Barton’s = FUN! Susannah & Kevin are among the early-morning adventurers who attend the Barefoot Boot Camp classes on Mondays & Thursdays. Kevin also comes to the Monday night Men’s Class, often demonstrating the poses he has practiced in boot camp. The boot campers are a devoted group, with a strong focus and commitment to their yoga. We also have fun. Kevin turned 40 on the day of one of our classes. We asked him what pose he’d like to pick to celebrate — he picked Savasana. So in honor of Kevin and Susannah and all of us who have celebrated the big 4-0, here is an illustration of this very useful pose! How long have you been coming to Evergreen? Kevin: I started my Yoga practice at Evergreen. Why did you start yoga? Susannah: In late 2014 I injured my back doing group fitness classes and ended up in 12 weeks of physical therapy. I had taken a few yoga classes in the past, but never consistently practiced. I decided to give EYC’s Boot Camp a try once I finished physical therapy in order to see if it helped my back and improve flexibility. It did just that and much more. 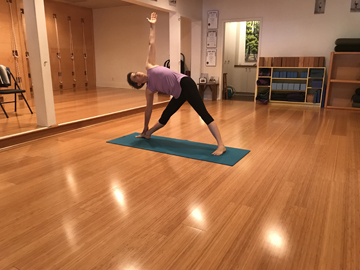 I’m now training for the St. Jude Half Marathon and am exercising more than ever, and I’m confident that I would not have been able to accomplish all that I have in the last year and a half without yoga. Kevin: Susannah, my wife, was very excited about starting Yoga Boot Camp at Evergreen and kept encouraging me to come. I was hesitant. I made her promise me that there would be other men in the class, and while that my or may not have been the truth, I couldn’t be happier that I started my practice. I love it. Susannah: I really like doing full arm balance because it make me feel strong! Kevin: Hard question to answer. I love inverted poses. I’ve been working at a free standing Sirsasana, but I also really enjoy Vrksasana. Susannah: My education is in urban planning and I work in the non profit, community development sector focusing on improving public spaces for all users. I am married to Kevin and we have two horribly behaved mutts, Milo & O.D. We enjoy walking down our block to Boot Camp at Evergreen twice a week! Happy 12th birthday, Evergreen Yoga! This year we are celebrating our birthday in a unique and special way called celebrate12! Twelve students will be sharing their yoga stories with you as part of our birthday celebration. Jennie Latta is the first student you’ll hear from (below). I hope these stories will energize you to keep growing in your yoga practice, to try new things, and see what happens. If you are just considering how you might begin a practice, experience is the best teacher. I hope you will be inspired to come to class and learn how to practice. Jennie has been attending the Barefoot Boot Camp classes on Mondays & Thursdays since February 2017. We had fun taking these pictures a few weeks ago. She has been practicing yoga occasionally for about six years, but more intensely for the past two years. I started yoga because it was part of another exercise program that I attended. I started to make it the focus of my exercise when I got to know more about it and the challenges it presents. Although I had been more or less active throughout my adult life, I started daily exercise when I finished chemotherapy in 2013. I practice yoga four to five mornings each week now. What are the benefits for you – physical AND/OR other benefits? I don’t always look forward to coming to the mat early in the morning, but I always feel terrific as the hour comes to a close and throughout the day. The benefits of yoga for me include strength, flexibility, balance, confidence, and perseverance. Do you have a favorite pose? 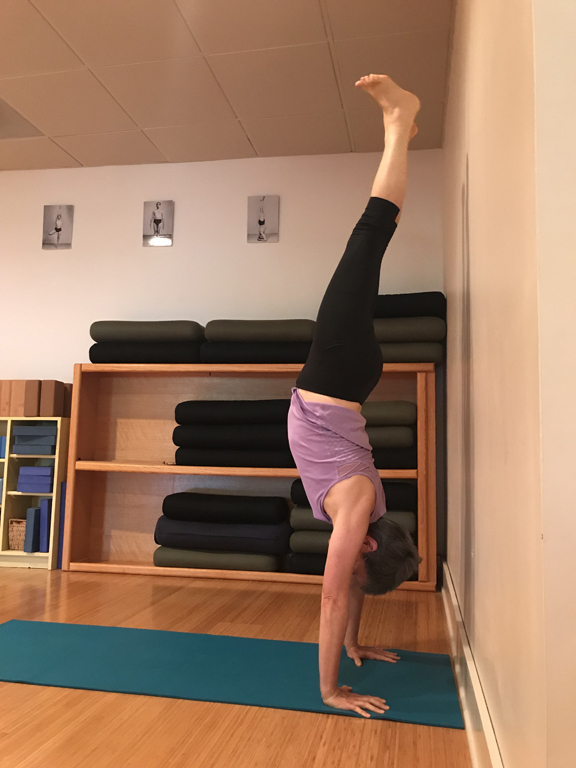 I really like arm balances and head stands – so inversions (although I’m not a fan of shoulder stand). I’m working on developing more flexibility. I was born and raised in Memphis and am 57 years old. I work as a United States Bankruptcy Judge and an adjunct professor at the Cecil C. Humphreys School of Law at the University of Memphis. In addition to the J.D., I have an M.A. in theology and a Ph.D. in philosophy, which might explain in part why yoga appeals to me. I am a Benedictine Oblate of Saint Meinrad Archabbey in Indiana, and like to sing Gregorian chant. I play bassoon in the Germantown Symphony Orchestra and the Memphis Wind Symphony. I like to knit — especially socks. I’ve been married to Jim Latta for 38 years. We have five grown children and three grandchildren. I am away at a workshop with Patricia Walden this week! (If you want to know more about her, click here). It’s rare that I have a chance to be a student. Studying is important to my personal yoga work…and ultimately my teaching. During this week’s workshop with Senior Teacher Patricia Walden, I am able to focus on myself. I learn a lot about how to teach by being a student under a senior teacher. 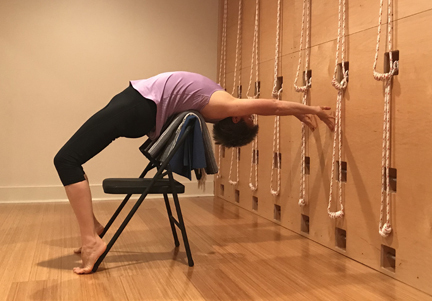 Patricia has studied Iyengar Yoga since she was 26, in the 1970′s. She studied and practiced personally with Mr. Iyengar until his death 4 years ago. I want to write about what this week is like. My process will be stream-of-consciousness. My goal is to share my experiences without laboring over grammar, spelling and my endless editing and re-editing. We will see where it leads. Tedrah is here too. I’m looking forward to hearing about what it is like for her. We are so busy here, we may not have a chance to talk about it until we return to Memphis. My one picture from yesterday is my lunch! Hope to take some better pics today. Traveling can be a challenge. I don’t like being away from the studio so much. The past 2 years have made travel necessary, and I’m examining my priorities. Spending time with my family is high on the list. Work and personal is a balancing act, especially when I love my work! But I know of no one who doesn’t have to deal with juggling things in this way. I realize I am not alone. Although soft-spoken, Patricia is clear and direct. Her instruction challenged me, and she also worked with the beginners. It’s remarkable how open these beginners are to learning. Her expert teaching means they are challenged according to their capacity, but without being overwhelmed. If you peeked in the studio window, you’d see a lot of people in work-out clothes doing poses – and a physically demanding! You might not notice right away, that while we practice she is teaching us lessons on yoga philosophy. The philosophy behind yoga practice translates into all of life. It is a practical discipline. One example was watching her work with a more advanced student on his over-working in Upavista Konasana. She showed some adjustments he needed to make in his pose to work on the correct action in the lower back. She used that and several other instances as a way of teaching Svadhyaya (self-study). She helped him to see where his body is over-working to the point of aggression. She also pointed out other places that needed strengthening. How much to d0 & not do. It’s a common theme in our asana classes. Patricia’s approach was subtle but strong. The student’s understanding of himself deepened. She started the morning reading from the Bhagavad Gita (Chapter 4, Sloka 34 & 35). I like Stephen Mitchell’s translation/commentary, and upon reading that I came away with the importance of a wise teacher. And that the goal of wisdom is freedom. Another topic of the day was practicing saucha (cleanliness). Today she focused on physical cleanliness. She encouraged us to remember that the body is an instrument of the soul. She suggested that we explore the importance of keeping the mind pure. It is an understatement to say there’s a lot of hubbub going on in our community and the whole world right now. I’ve had concerns that our philosophy discussion would include something bordering on politics. I was wrong. She keeps the focus of why we are practicing yoga and what our personal responsibilities are. We are studying sutras II.40 & II.41. Today there will be further exploration I think. We are heading toward cultivating attitudes that create purity of manas (mind), and ultimately a sattvic (serene) state. She said “sattva-cize” your mind. Using Sanskrit in an English way can make the directive more clear. Seeing my yoga friends from around the country! Friendly & smiling faces. There are about 40 participants, and I know about half from other trainings over the years. Spending time with my husband who is here with me! He is enjoying the museums here and learning how they have evolving over the years. I am impressed with the Legacy Wall at Dallas Museum of Art. The focus was on a married couple who gave their collection to the museum. The DMA is downtown, and it is interesting to see how the museum integrates their sculpture garden into their indoor collection. Friday evening we head to the Louisiana Film Prize Festival to see what is possible for the Memphis Film Prize. Seeing my teacher Randy as a student, rather than a teacher. He works just as hard (maybe harder) than us students. A good example for me to see. Plus, his sense of humor always brings a lightness to my more serious side. Eating! After class yesterday morning I was starving, and devoured my lunch. A great and filling salad (see photo). Sadly, it’s the only photo I took all day. So it looks like I’m here to eat, not study. Oh well, maybe better photos today. OK – I’ve just finished breakfast and moving onward to Day 2!